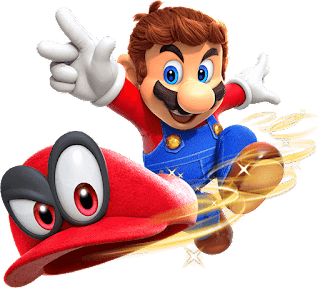 Odyssey is the latest (2017) Mario 3D platformer for the Nintendo Switch. Once again, Mario needs to save Princess Peach from the clutches of Bowser. The game is pretty open-ended and allows for a lot of exploration but the game can be played through without trying to accomplish every tasks. For beginners, there is an Assist mode that will show you the way to progress through the game, prevent you from dying by falling over an edge and lets you regenerate health when resting. While having this mode is great especially if you want to avoid having younger players get frustrated, most people, including kids, will do just fine in normal mode. My son was able to finish the game in normal mode and this was his first platformer (besides Cuphead which he quit after a few tries). The graphics of the game looks great on the Switch screen. The puzzles are fun and can be solved in a brief session which is perfect for playing on the go. The 2D portions that uses 8-bit graphics for the looks of the original Mario games. I wonder how many kids understood that? The main game is fairly short but there's plenty of extras to keep play value going. Sometimes I fall off the edge thinking I was going straight when I wasn't. Need to turn the camera to get the right perspective. Mediocre story, but it's a platformer so while I don't really expect it to have one. If you own the Nintendo Switch then this game should be part of your library. Not only can you enjoy it, but kids will as well.